When should your aspiring ballerina go en pointe? Unfortunately, going to full pointe can be something of a rite of passage, and social pressures within the ballet environment may make it seem more important than it really is. » Figure 1 Figure 1: Dancers should master techniques en flat prior to taking them to demi-pointe or full pointe. Historically, the decision to go en pointe is made by the ballet instructor. In many traditional, formal training programs, a weeding out process occurs based on both ability and the “ideal” ballerina body type. Dancers not deemed capable of a professional career were simply not advanced, and frequently were dropped from the program. But these criteria have no basis in today's dance schools, and variations in criteria have led to confusion and sometimes controversy even among ex-perts today. Dr. James Garrick at Dance Medicine Division of Center for Sports Medicine at St. Francis Hospital in SF, CA, feels that adequate strength is needed. This includes only the ability to perform a solid passé in demi-pointe, and the ability to go from grand plié in center to standing with knees straight with no wobbling and no foot adjustment. Dr. Richard Braver, former medical consultant to Capezio, feels that the dancer should be able stand on demi-pointé for 45 seconds on each foot, without faltering or wob-bling. Celia Sparger, Physical Therapist, and noted author of ballet anatomy, feels that classes once per week is never enough preparation for pointe work. She also prefers excellent technique in demi-pointé, with no tendency to sickle in/out the foot, or curl or clutch the toes. » Figure 2 Figure 2: The International Association of Dance Medicine & Science released a consensus statement in 2009. Ideally, the basis of going en pointe is the ability to solidly perform all the techniques in demi-pointé before proceeding to full pointe. The International Association for Dance Medicine & Science (IADMS) tried to bring some consensus to the area, and released their statement in 2009 (link to full article in references below). It asserted that dancers should be at least in their 4th year of practicing at least twice per week after age 8 in a program designed to train professional ballet dancers. This is to develop strength, range of motion (ROM) and technique, so that there is “good trunk/abdominal/pelvic control, correct alignment of legs, and sufficient ankle/plantarflexion ROM.” (Plantarflexion is the ability to point the foot down as if going en pointe). Screening x-rays to look at growth plate status are felt to be unnecessary. It emphasizes that going en pointe too early compromises technique development and risks confidence and worse yet, injury. » Figure 3 Figure 3: Pencil Test. 180 degree angle between tibia and plantar (top) aspect of foot. » Figure 4 Figure 4: Airplane Up and Down. Sparger has written an excellent article suitable for parents and young dancers called “Why Can't I Go On My Toes” available online at the Capezio website (link in references below). » Figure 5 Figure 5: Neutral, supinated, and pronated feet. 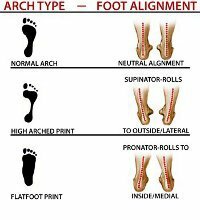 According to Janice Barringer and Sharon Schlesinger, authors of The Pointe Book, the ideal foot is wide, with the first 2-3 toes of the same length. Long 2nd toes have difficulty. As do narrow-pointed feet with high arches (causes toes to curl under). Limited ankle flexibility predisposes to Achilles tendon problems, because the heel bone gets pushed into it on pointe. Pronated feet (see Figure 5) lead to bunions and longitudinal arch problems, while supinated or sickled feet (see Figure 5) lead to ankle sprains—both conditions might be prevented with appropriate strengthening exercises. Not everyone can have ideal anatomy, but everyone should have ideal technique before going en pointe. Those with less than ideal foot shape, need to pay particular attention to appropriate footwear. Those with less than optimal ankle ROM need to be aware of how such restrictions affect balance and put stress on the rest of their body while dancing. 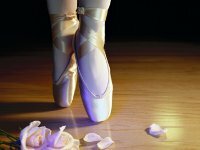 Finally, researchers at Harkness and others point out that it is also important to consider taking the young dancer off pointe during a growth spurt. Frequently, muscle growth does not keep up with the bones, so flexibility will need to be regained with time and stretching. Furthermore, changes in centers of gravity and limb proportion will affect balance and timing of technique. Correct technique should be regained back en flat then demi-pointe before returning to full pointe. 1. “When Can I Start Pointe Work? Guidelines for Initiating Pointe Training, An IADMS Resource Paper” by David S. Weiss, M.D., Rachel Anne Rist, M.A., and Gayanne Grossman, P.T., Ed.M. 1. “Principles of Dance Medicine, Clinical Management of the Dancer Patient”, an Educational Conference at the Harkness Center for Dance Injuries, July, 2010. 2. Dance Injury & Prevention, 3rd Edition by Justin Howse, MD. Routledge Publications. 3. The Pointe Book, shoes, training & technique, 2nd Edition by Janice Barringer and Sarah Schesinger. Princeton Book Company, 2004. 4. Dancing Longer, Dancing Stronger by Andrea Watkins and Priscilla Clarkson. Princeton Book Company, 1994. 5. Preventing Dance Injuries, 2nd Edition by Ruth Solomon, John Solomon, and Sandra Cerney Minton. Human Kinetics, 2005.